Poi-Kalyan, Complex Poi-Kalyan, Minaret Kalyan, Mfdrasah Miri Arab, Minaret of Death, Architectural monuments of Bukhara, Sights of Uzbekistan, Sights of Bukhara. 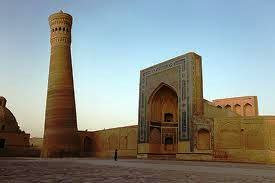 Architectural complex Poi-Kalyan means «Foot of the Great» is situated in Bukhara, at the foot of the minaret Kalyan. Complex consists of three constructions built in XII-XVI centuries: madrasah Miri-Arab, mosque Kalyan and minaret Kalyan – “Great minaret” is the main decoration of the complex. 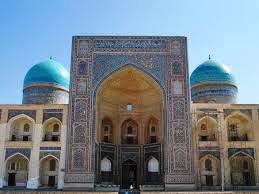 Poi-Kalyan is one of the central architectural ensembles of Bukhara. It had been the main centre of ancient Bukhara. Minaret Kalyan is one of the greatest buildings of the Muslim East. It was used not only as a tower of the mosque but as a patrol tower, from which one could see all the neighborhoods of the city. Later it became the place for public executions, hence another name of this Great minaret – Minaret of Death. The height of the minaret is 45,3 metre, diameter of the basis is 9 metre. The building is the powerful pillar with a round lantern on the top. The minaret is covered with ceramic tiles, which represent different geometric shapes – square, circle, half circle and triangle. There is an Arabic inscription in the middle of the minaret resembled simple ornament. The other inscription is under the very basis of the lantern. Minaret Kalyan is one of the oldest monuments in Central Asia, where colorful tiles were used. Madrasah Miri Arab is a masterpiece of medieval Islamic architecture.It is a rectangular building with powerful portal on the main façade. There is an entrance leading to the lobby in the main portal. There are darshanas - classrooms for students at the corners of the building. 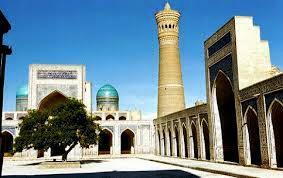 Madrasah takes half square of the ensemble of the cathedral mosque of Bukhara. Supposedly, the madrasah was built by Sheikh Mir-Arab Ieman, who later was buried in this building; there is also the tomb of the ruler of Bukhara Ubaidulla-Khan. Extremely beautiful portal is adorned the façade of the madrasah which is paved with colored tiles. The dominant color is blue. The walls and arches of the building are covered with fancy ornaments;　geometric patterns are covered with glazed bricks. Madrasah Miri Arab is second-largest in size (after madrasah Kukeldash) madrasah in Bukhara.